I wouldn’t usually and willingly go into a cinema to watch a movie about sea pirates, not even pirates of the Caribbean, but if it was a Tom Hanks then it’s a must see movie regardless of the story or the trailer. I went to watch Captain Philips yesterday and I have to say I wasn’t disappointed at all. 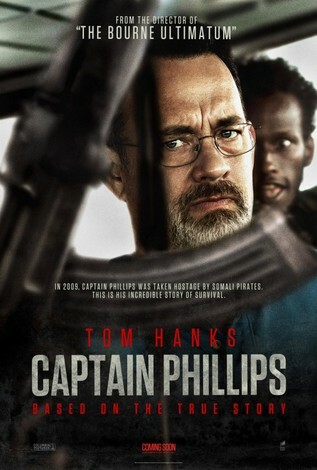 Captain Philips movie is based on the true story of the real Captain Richard Philips who was captain of the Maerask Alabama cargo ship that was hijacked by Somali pirates in 2009. The movie is almost entirely shot on the ship and a lifeboat, with some gory bloody scenes and lots of violence. It makes you wonder how a small boat with only four pirates with rusty rifles can hijack an entire cargo ship. Its also quite sad, how those poor young men resort to a life of crime and piracy for a living in this day and age. I wonder why cargo ships aren’t provided with any kind of weaponry to defend themselves against such attacks if they are working in dangerous waters. The movie is long and I enjoyed watching it but I doubt I’d enjoy watching it again. It’s the kind of movie you watch once in the cinema and not at home on a DVD but I’d still add it to my DVD collection since Tom Hanks acting was superb as expected. Truly an edge of the seat thriller. Am having a tough time though, settling on which of the two: the Prisoners or Captain Philips was the better film. Incredulously, I found Gravity, a tad boring. To some this may sound blasphemous but I truly do not much enjoy films that only celebrate the technique of film making without much else going on by way of acting, plot or the story line. A case in point is Avatar or Memento. Instead ‘ Amour’, ‘Les Choristes’ and The Battle of Algiers are all my kinda films. Interestingly, the latterly films are available in full length format with English subtitles on YouTube. Comparison between the two wouldn’t be fair since they are totally different, but though I enjoyed Captain Philips more I wouldn’t watch it again while I would watch Prisoners. I didn’t go watch Gravity yet since I’ve heard so many negative reviews and how the most important part which is the ending was chopped off so I think I’d wait and watch it on TV or rent it and watch it properly. I loved Avatar, when I got out of the cinema I longed to find the world had transformed into the glittery world of Avatar, but then I found I couldn’t watch it a second time no matter how hard I tried!